Closely resembling antlers, this branching Acropora is known as the Antler Coral! The Anther Coral Acropora microphthalma is one of the familiar branching Acroporas. It belongs to a group of Acroporas called the horrida group. This group of corals all have similar forms, with the branches having a rough surface. Their branching growth forms have been used to describe them with common names such as Antler Coral, Staghorn Acropora, Staghorn Coral, or Branching Acropora. Although the Antler Coral needs excellent care like all the Acroporas, it is one of the easier Acros to keep in aquaria. They are also easy to identify, having same sized corallites. They come in creams, brown, and pale gray, though aqua cultured specimens are available in blues, greens, and even yellows. A. microphthalma is smaller than the other Staghorns. The A. microphthalma have been propagated in captivity thus helping to spare wild populations in the world's reefs. Buying captive propagated A. microphthalma helps the aquarist, since they are a little more hardy than their wild siblings, but they can still succumb to diseases typical to Acros. The Antler Coral, Acropora microphthalma has a potential of reaching 6 feet across and the video at 1:54 shows an Antler Coral with a symbiotic crab! All Acropora have similar needs as far as strong light, a surge like strong water flow and need to be kept out of reach of aggressive corals. Stability is the key to keeping Acropora and adding all the species you want at the same time as frags allows them to "grow up" together. Often a new Acropora can cause the entire population of Acros to "bail out" their polyps and die within a few hours. This is the second video of helpful advice and information about Acropora. While considered the "Crown Jewel" of the marine reef hobby, many avoid them due to their touchy nature. Learning more about them may help the aquarist have better success in keeping this varied and beautiful coral! Information in the marine hobby constantly changes and evolves, so keeping up with the latest finds is our responsibility to our stationary animals. Distribution / Background Acropora Coral Information: The Anther Coral Acropora microphthalma was described by Verrill in 1859. They are in what is called the horrida group of Acroporas that also include A. kirstyae, A. horrida, A.toruosa, A. vaughani, and A. austera. They all have similar forms to A. horrida with the branches having a rough surface, Some common names they are known for are derived from their growth form, such as Antler Coral, Staghorn Acropora, Staghorn Coral, and Branching Acropora. 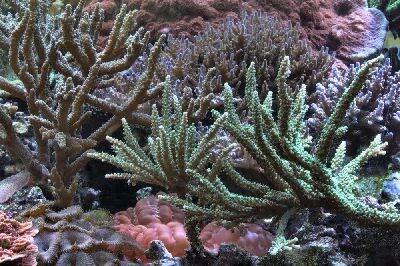 Where Acropora Corals Are Found: A. microphthalma are found in Australia's Great Barrier Reef, the Coral Sea, and around the Houtman Abrolhos Islands of Australia. There are also colonies from Madagascar to the Marshall Island and then to the Ryukyu Islands. Acropora Coral Habitat: The A. microphthalma are found in sandy lagoons or turbid waters. Acropora spp. corals are found across the reef in various locations from turbid waters (with sediment or foreign particles stirred up or suspended in the water) to those with strong waves and high currents; from areas where there is little light to being fully exposed to the sun (and the air) at low tide. Status The Acropora microphthalma is on the IUCN Red List for Endangered Species as Least Concern (LC). Description What do Acropora Corals look like: All Acropora Spp. corals have very porous and lightweight skeletons. They are constantly forming new branches that grow in an irregular pattern. The branches can be anywhere from horizontal to vertical in growth, and in a thicket pattern. Their branches are a little more stout than other Staghorn corals. Their corallites are small and they are all the same size. Acropora microphthalma are pale grey, pale brown or cream, with aqua cultured colors of green, blue, and yellow also available. A. microphthalma can be confused with A. horrida. But on simple examination, you will see that A. horrida has corallites of different sizes all over the branches. The natural colors of A. horrida are usually blue, light purple, or cream with light purple to pink tops. Acropora Coral Life Cycles: The Anther Coral A. microphthalma can grow over 6 feet (2 m). It reaches sexual maturity within 3 to 5 years, with a branch diameter of 1.5-2.75" (4-7 cm). They can live 4 to 7 years. Acropora need to be carefully acclimated to their new homes. They need to be placed in their permanent position within a tank after acclimation. It takes about 5 to 6 months for the A. microphthalma to regain their normal growth rates after being added to an aquarium. Moving Acropora from place to place will stress them, and possibly cause death. A typical live rock/reef environment is what is needed for your Anther Coral , along with some fish for organic matter production. A mature tank (well over a year old) is advised to increase the chance of successfully keeping Acropora. Availability Acropora Corals for Sale: The Anther Coral A. microphthalma are moderately easy to find at pet shops and on line, as well as from frag farmers and reef clubs. They are often confused with other staghorns, so learning to identify them before purchasing helps make sure your getting this species. Online they can run about $49.00 USD or more depending on size and color.